IMANTA - Homesite lot #12 - Punta de Mita - Riviera Nayarit - The Mexico Land Catalog - Development Land and Homesite building lots for sale in Mexico. 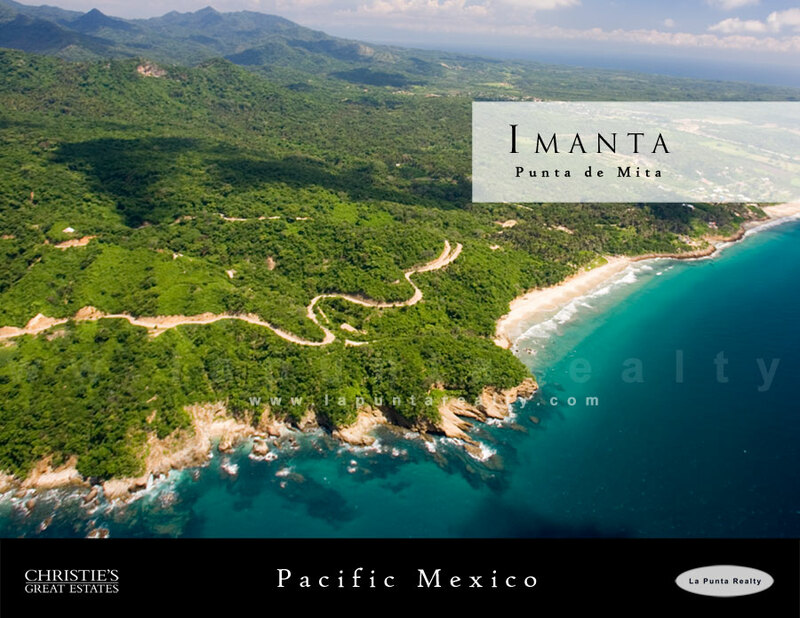 Homesite lots within the IMANTA Resort at Punta de Mita. From $11′200,000 USD to $4′900,000 USD (construction costs not included) with 85 meters of frontage and a total surface of 7,462 square meters this lot is located on a cliff but it is pretty easy to build stairs to get right on the sandy beach. Click here for a full profile. Spectacularly situated in the heart of mexico’s most majestic landscape, IMANTA Punta de Mita is a hidden gem. IMANTA Resorts Luxury Residences, Boutique Hotel/Spa, and signature Lots represent a unique concept: the harmonic interaction of natural beauty in magnificent places with environmentally sensitive architectural design that highlights the individual charm of each site. The story of Imanta is really the story of our name: Imanta, “Magnetic Attraction”. It’s the feeling you get when you fall in love with a person or a place. It’s immediate, exhilarating and mysterious, the way we think you’ll feel when you come here.We first experienced this sense of ‘imanta” on a four-day visit to Thailand where we were in search of a place to “get away from it all”. After many years of searching for the perfect place, we knew we had found it the minute we set foot on the shores of Imanta.Originally called “Playa Los Orcones”, here was Nature at its most resplendent, a magical place where the jungle met the ocean in one of the world’s most majestic landscapes. Spectacularly situated in the heart of Mexico’s most majestic landscape, IMANTA Punta de Mita is a hidden gem. IMANTA’s first resort is located in Punta de Mita, 30 minutes from Puerto Vallarta’s International Airport, on the Riviera Nayarit Mexicana, Mexico’s Gold Coast. What we found there enchanted us. Nature and luxury existed in complete harmony. As hoteliers, we were impressed with the extraordinary level of service we experienced. As humans, we had fallen in love with a way of life. Since that first visit to Thailand, we were determined to provide this same balance of nature and luxury in our native country of Mexico. We were astonished by the incredible variety of wildlife, by the vegetation and the cycle of the seasons, by the way the earth and the sea attracted us like a magnet force, binding us completely to this place. We decided immediately to buy this property and to implement our dream. Designed by Overland Partners, IMANTA’s Casas have been created as a work of art. Nowhere is this more evident than in the masterful blending of architecture and the land. The Casas at IMANTA have been built by expert craftsmen usingmostly local materials in a way that evokes the spirit of pre-Hispanic Mexico. Our concept is minimalist and contemporary, yet inspired by the richness of our Mexican heritage and by the exquisite artistry of Asian culture. We are committed to using the best and most sustainable materials, woods and fabrics. All the Casas have been designed with guests’ complete comfort as our goal. Most bedroom suites have full plunge pools or custom Jacuzzis handmade in stone. Master suites have two main bedrooms, each with its own large full bath. In addition, there is a large living room, dining room, well equipped kitchen and an extra half bath for guests. Many of the architectural details and custom furniture that make IMANTA so special were specifically designed for IMANTA Punta de Mita. Our magnificent stone bathtubs have been hand hewn from the giant boulders that characterize the site. Las Cuevitas – Riviera Nayarit Cajón de Peñas – A lake of opportunity!